SEDEX Model LC combines high sensitivity, reliability and accuracy for all your analytical works, thanks to unrivalled SEDEX Technology. This detector presents a new design and a number of outstanding innovations providing the best optical and electronic benefits at a very competitive price, thus representing now the ELSD with an unrivalled performance / price ratio in Liquid Chromatography. This small unit occupies only 10 linear inches of bench space. Full SOP protocols are provided for GLP compliance and validation procedures. 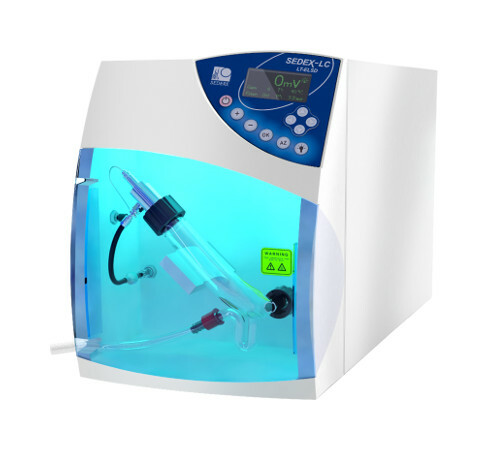 SEDEX Model LC provides the Cost-Effective solution in Low-Temperature Evaporative Light-Scattering Detection for standard Liquid Chromatography. Control of the system can be done either locally or via a PC. A remote shut down mode is also provided to minimize cost and enhance system lifetime. A single and dedicated SEDEX LC HPLC nebulizer and an innovative cell design minimize band broadening. This nebulizer covers the flow rate range from 200µL/min to 2mL/min and can be readily and quickly mounted and dismounted. With SAGA (SEDEX Automated Gain Adjustement), an innovative gain control available when it is driver-controlled by software, SEDEX LC automatically adapts the gain setting to avoid any off-scale saturation of the detector. Complete Remote Control: the gas, heater, photodetector and light source can be automatically shut off at the end of a series of analyses. SEDEX LT-ELSD allows for detection of essentially all compounds: detection is based on a universal property of all analytes and does not require the presence of a chromophoric group, electroactive group, etc.